Description: 50% mohair – 50% shetland wool, hand kettle dyed before spinning. Price: $18/skein plus shipping. 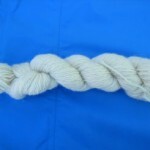 Flat Shipping provides discount above 4 skeins. Description: 50% adult mohair – 50% shetland wool, natural colored adult mohair and wool. Description: 50% adult mohair – 50% shetland wool, natural colored mohair and wool. Price: $12/skein plus shipping. Flat Shipping provides discount above 4 skeins. 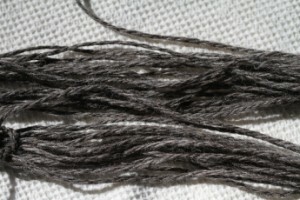 This is a bulky yarn in natural dark grey. It is on cones and thus sold by weight requested. Perfect for weavers. Can be wound into skeins on request, no charge. It is also available on cones. Price: $5/ounce, $28/ 8 oz (savings of 48%), $49/pound (savings of 54%) plus shipping. Savings is for fiber + shipping versus 1 oz. fiber purchase. Description: 45% Mohair (Jessie & James) dyed with walnuts before spinning & 55% natural colored Shetland wool (Brown Betty, Bison Boy and Spook). These skeins are soft and springy with depth of color from blending 3 shades of brown. Hand kettle dyed before spinning.